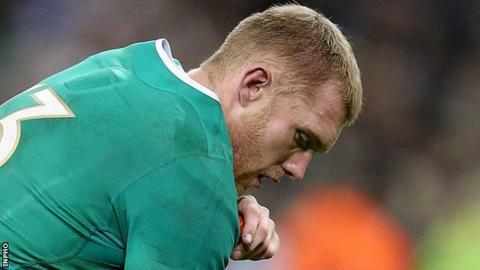 Ireland winger Keith Earls could miss Saturday's Six Nations match in France after suffering a suspected concussion in the 16-16 draw with Wales. The 28-year-old Munster player must now go through the return-to-play protocols to prove his fitness for the match at the Stade de France. Fly-half Johnny Sexton avoided serious injury despite suffering a blow to his chest, the Irish camp revealed. "I think Keith has probably suffered a concussion," coach Joe Schmidt said. "He will be considered to have had a concussive impact and that will certainly put him in doubt for next weekend. "Johnny is sore without a doubt, but I was just talking to [Wales centre] Jonathan Davies in the corridor and he's sore too." Irish flanker Tommy O'Donnell passed a head injury assessment and is free to return to training. Ireland expect to have full-back Rob Kearney and flanker Sean O'Brien available for selection to face France after both missed the Wales game with hamstring problems.